Get a room. At least that’s what Microsoft’s Stefan Weitz jokingly uttered when @Bing and @Twitter had a flirty exchange of tweets on Tuesday. 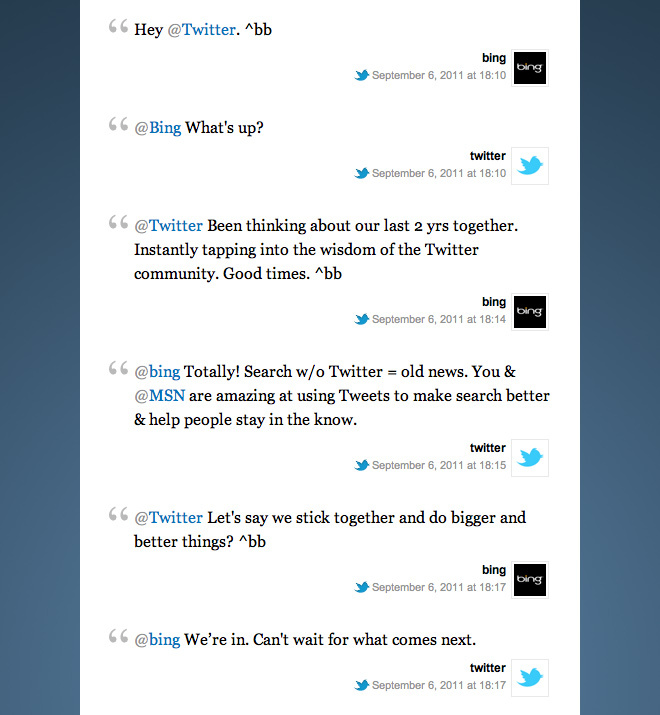 Turns out it was a lighthearted way to reveal the news that Microsoft confirmed shortly after; Twitter and Bing have renewed their search partnership. Following a brief reflection of their steady two year relationship, Bing and Twitter continued to plan their future together. Carolyn Penner took the liberty of using Storify to compile the conversation, as pictured below. Google had struck a similar agreement with Twitter back in October of 2009 as well; the Twitter integration was a part of a service called Google Realtime Search which allowed you to monitor social networking sites in line with your search needs. However, following the launch of Google+, the company got rid of Google Realtime Search and confirmed their plans to not renew their agreement with Twitter. Social integration is certainly something that Bing has been working hard towards to provide them with an edge over the competition. For example, Bing announced deeper Facebook integration in May which improved search results by displaying your Facebook friends’ recommendations (where relevant) within the results, among other things. In conclusion, here’s an additional tidbit of news about the search engine: The Bing home page received a slight makeover. It’s no HTML5 revamp, but interesting improvements to the layout were made. 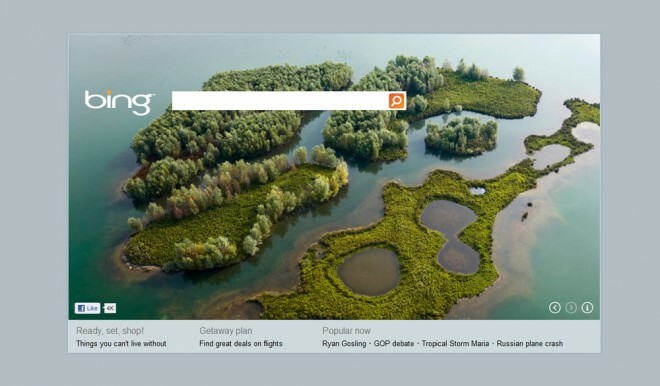 The text links to the various sections of Bing were moved to the top-left of the upper navigation area, the Facebook like button was slightly moved up, the font size for those little blobs of text below the image were increased, and an “information” button was added to the right of the back and forward buttons, which have received a size increase. Whew. Could these improvements be a small prequel to the highly-anticipated HTML5 improvements that Microsoft are set to unleash? We’ll see. If you have been following semantic technology developments and Web 3.0 then I came across an interesting forthcoming internet search engine, the first of it’s kind to understand concepts instead of keywords, pretty interesting stuff.